Please Note: This post was originally posted in 2016, so while most of the links still work, we cannot guarantee it anymore. However, we have updated and released a new Top Ten Christmas Gifts list for 2018, which you can visit by clicking here. It’s that time of the year again, when we all panic about presents and spend way too much time at the mall, being forced to listen repeatedly to that Michael Bublé Christmas album before they finally change the track to that Celine Dion Christmas album…and your ears start bleeding. Or maybe you’re too busy watching the hockey game instead, and will find yourself shopping at 7-Eleven for gifts as they’re the only thing open at 10pm on Christmas Eve (everyone loves corndogs as Christmas presents, right?). Well, of course we’d promote our own stuff. Why? 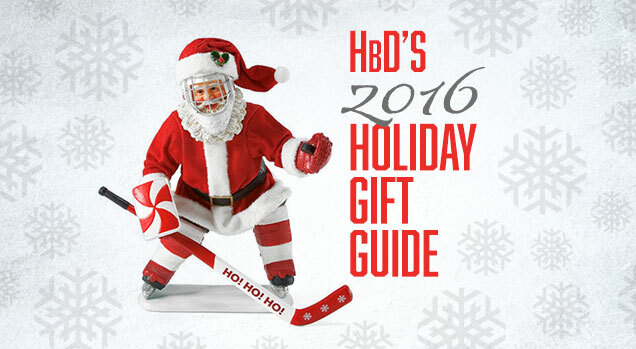 Because if you’ve got a hockey fan to buy for, they’ll love it. Posters, stickers, t-shirts, mugs, pillows, we’ve got something for everyone. Whether it’s a team-specific pillow that they need to class-up that beaten down couch they watch hockey on, or our mugs to sip hot chocolate (with Baileys, naturally) while watching the game, we’ve got something for the hockey fan anywhere. During his playing years, the tight-lipped Bruins legend was never one to indulge the media with personal details, but in 2013, Bobby Orr finally penned and published his autobiography. In the second year of the league, the National Women’s Hockey League offers an amazing experience that won’t break the bank. With the best athletes in women’s hockey, NWHL games are fast-paced, exciting, and make for a really great time for all hockey fans. The league is host to four teams: The Boston Pride, Buffalo Beauts, Connecticut Whale, and New York Riveters. Single game tickets start at $20 but keep an eye on their social media pages for all kinds of discounts! Great hockey. Good prices. Can’t beat that. Adam Sandler sang about Chanukah being eight crazy nights instead of just one day of presents, but the Hockey Stocking kind of makes me wish I celebrated Christmas too. If you’re looking for a creative way to decorate your mantel, show off your team colors with one of these adorable knitted skates. This isn’t quite an intervention per say, but we think it’s time you get that man-cave organized, huh? Here’s the perfect solution: A big dry-erase whiteboard designed to look like an NHL ice rink! Yes, we agree, It’s pretty awesome! Last year we included the Gents on our last-minute gift guide for their designer-approved apparel and badass ornaments, but this year they’ve added a cozy Christmas sweatshirt into the mix that you’ll want to live in all winter long. Drinking and watching sports go together just about as well as drinking and holidays, so what better way to combine the two than by drinking out of the world’s best trophy? (well, close enough). 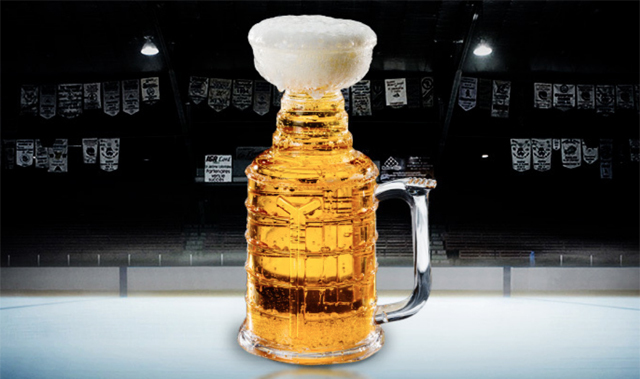 The Stanley Stein is the perfect glassware for any beer-loving hockey fan on your list – so perfect that the keeper of the cup himself even recommended it.